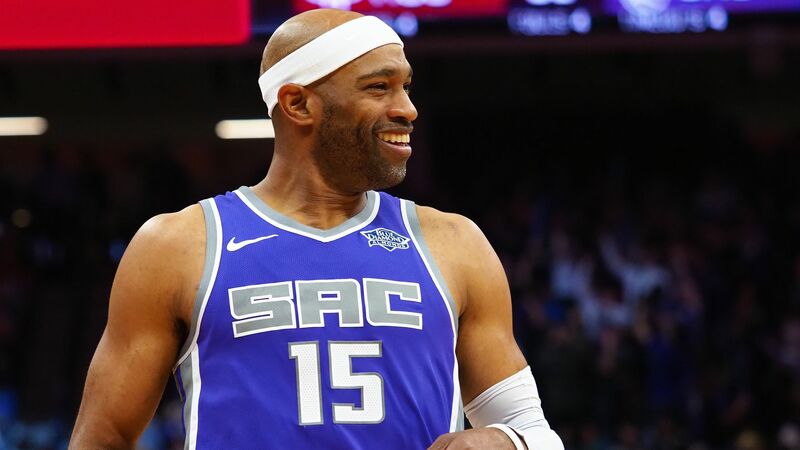 In a move very few saw coming, 41-year-old Vince Carter has signed a one-year deal with the Atlanta Hawks. In what could be his last season in the league, Carter will tie Robert Parish, Dirk Nowitzki, Kevin Willis and Kevin Garnett for most NBA seasons ever played with 21. According to Yahoo Sports’ Shams Charania, the deal is worth the veteran minimum $2.4million and will see him become the oldest active player when he turns 42 in late January. There was growing speculation amongst fans that Carter would sign with the Toronto Raptors but the UNC product opted to head south instead to the rebuilding Hawks. After memorable stints with Toronto, New Jersey and to a lesser degree Orlando, Carter has been somewhat of a journeyman in the NBA. The 6’6″ wing played 51 games with the Suns before heading to Dallas for three seasons where he played 223 games out of a possible 246, quite the feat for a then 36-year-old. The eight-time All-Star then joined Memphis where he averaged 6.9 points per game in just under 20 minutes of action per night. While age was catching up to Carter, his efficiency didn’t fall away. An effective field goal percentage of 51 per cent in the 2016/17 was the third highest of his now two-decade career. The 2000 NBA Slam Dunk champion has been somewhat fortunate with injuries despite his age, with a rib injury and kidney stones the only significant speedbumps in an otherwise uneventful 2017. Whether Carter can actually contribute to the Hawks is an interesting point of discussion. The 41-year-old has certainly slowed down in his old age but can still be a presence in the locker room with all the young faces. Under former Philadelphia 76ers assistant coach Lloyd Pierce, who was born just eight months before Carter, the franchise will be building around cornerstone Trae Young, who was selected fifth overall in the 2018 NBA Draft. Young will turn 20 in September and has been likened to a young Steph Curry after shooting 36 per cent from behind the arc for Oklahoma in his one season in the Big 12 Conference. While the pair have drastically different styles of play, Carter’s experience will be crucial in guiding Trae Young’s development off the court. Carter will likely be inducted into the Naismith Hall of Fame after having a profound impact on basketball pop culture while also dominating on the court itself. Currently sitting on 24, 868 points for his career, Carter could easily catch Jerry West, who sits just 343 points ahead of him. Averging four points per game on a young Hawks roster can’t be that hard, can it? At his peak, Carter averaged 27.6 points per game for the Toronto Raptors; throwing down memorable dunk after memorable dunk, building the foundation of basketball in Canada. Without him, and of course Tracy McGrady, basketball north of the border certainly wouldn’t be where it is today and Carter’s high-flying theatrics were a huge part of what brought people to watch games, even if the Raptors weren’t always winning. He may be a far cry from Vinsanity, but it would be quite the sight to see Vince “Half Man, Half Amazing” Carter, throw down one more windmill dunk and bring out the motorbike celebration one last time.